We recently came across the topic of Brooding Perfectionism. There are different types of perfectionism (e.g. 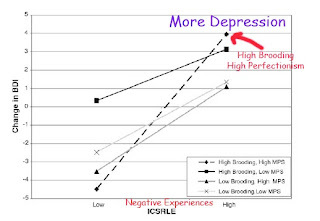 failure to live up to one's idealized standards or failure to live up to idealized others' standards), but brooding perfectionism adds the element of rumination, which Olson and Kwan define as "a maladaptive style that is defined as the unintentional process of repetitively and passively thinking about one's negative emotions and focusing on depressive symptoms and their meaning." It can be a difficult vicious cycle because reflection and seeking to understand both seem to be good things - but what's striking is how negative an effect rumination has on general thinking (it swamps working memory), problem solving, and resilient behaviors. Excerpt (sorry the whole article is not available free access - but it can be rented with a free DeepDyve.com trial): "A ruminative response style has also been shown to prolong depressive episodes. 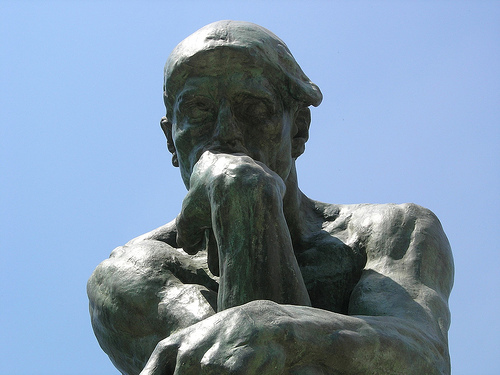 Rumination leads to irrational, negative interpretations of life events. In addition, focus on negative thoughts leads to an absence of potential efforts to ameliorate the consequences of a negative life event. The combination of a depressed mood and rumination may activate doubt regarding one's problem solving abilities, leading the individual to give up hope on solving problems. Individuals may also believe that their problems are less controllable than they actually are. These individuals are unsuccessful in efforts to diminish the problems, focusing more on their emotions than on productive behaviors that could potentially correct the problems." What the researchers found is that a ruminative tendency predicted whether depression would be severe in the setting of setbacks. High brooding perfectionists were not more depressed as a group when they hadn't experienced serious negative life experiences. But they were very vulnerable to depression when negative events occurred. For another great read, check out Rethinking Rumination. Interesting tidbits covered included the difference between worry and rumination, the difficulty that ruminators have with task-switching, the paralyzing effect of rumination (more think than do), and rumination's effects on attention and memory bias. It turns out ruminators are more likely to generalize rather than specifically remember from life events (autobiographical memory). Fortunately, the paper also includes interventions to overcome rumination and there are papers like this Seligman paper have specific suggestions to reduce destructive rumination and increase happiness. For highly intellectual persons, it can be freeing notion learning more about this dark side of reflection and perfectionism. For a pretty accessible self-help book, check out The Power of Now.